I bought the Kadee 2-56 tap and drill set from a local hobby store. I used a jig made from scrap styrene and a piece of card stock to drill the hole to tap in the same spot on both ends, then I glued scraps of styrene, mitered at 45 degrees, drilled through those, and tapped them all. To get all of the length-wise members of the frame the same length, I put a brick on the edge of my work table next to my miter box. With the stock against the brick, I was able to get two identical cuts. Here's where I need some help. I've started to work on the side paneling, and I find that I get really rough cuts on the inside parts, especially in the corners. I used the same approach I did last time, printing out the pattern from the computer, using a white glue stick to glue the pattern to some styrene (.020"), using a straight end and a hobby nice to cut it out, then peeling the peeling the pattern off. What's a good way to get a nice, clean cut on these details? Do I just need a sharp knife and patience, or is there a trick? Well, I finally got around to making some progress. Truthfully, I've been intimidated by the hand rails and figuring out a way to make lots of them all the same. But, I took today off and decided I would figure that out, and I did! I used toothpicks, scrap 1x2 wood stock, scrap .040x.060 styrene stock, some CA glue, and a pin vise with a .020" drill bit and a 1/16 inch drill bit. The first step was to make a computer drawing of the hand rails with marks on the insides of the bends and print out one copy for each bend and print that out. I put multiple copies on one page, with plenty of extras, in case I messed up. Each brown circle is the same diameter as a toothpick, which is about .080". The inner circle is .020". After gluing the template to the 1x2, I drilled out the .020" hole as a pilot hole, then drilled a 1/16" hole on top of that. I cut most of the tooth pick off, then pressed the remainder, pointy-end first, into the hole. I tapped it with a rubber mallet a few times. I then put a length .020" brass rod against the toothpick on the outside of the bend and glued a small piece of styrene on the outside on the other side of the rod. I added bits of styrene if the one piece wasn't enough to hold the rod in place. I then bent a test piece to check that it worked, first using my fingers and then using a the stub-end of the toothpick from earlier. I repeated for each of the bends. There were four for these hand rails, so I have four jigs. I wrote on each jig in sharpie what they are and what type of rod they can be used for. To use the jigs, I just slide the rod between the styrene, pull the rod with my fingers around the tooth pick post, then push it around using the stub-end of a cut-off toothpick. I push it a little further than desired, since it springs back. I'm pretty happy with how the hand rails turned out; the two I made are within a few hundredths of an inch of each other at the furthest. I hope someone finds this helpful. Cheers! A nice piece of work. well done that man. So, two steps forward after three steps back. It's been a busy month, that May! Since I want to make a more than of these flat cars, and I was having a really hard time eyeballing cuts, I decided to make some jigs to make putting these together easier. I also create a template on the computer (first picture) that shows where things are supposed to be cut out. Like I did earlier, I glued a printout to some styrene, then cut along the lines with a sharp hobby knife blade and and a metal ruler to get the sheet parts I need. 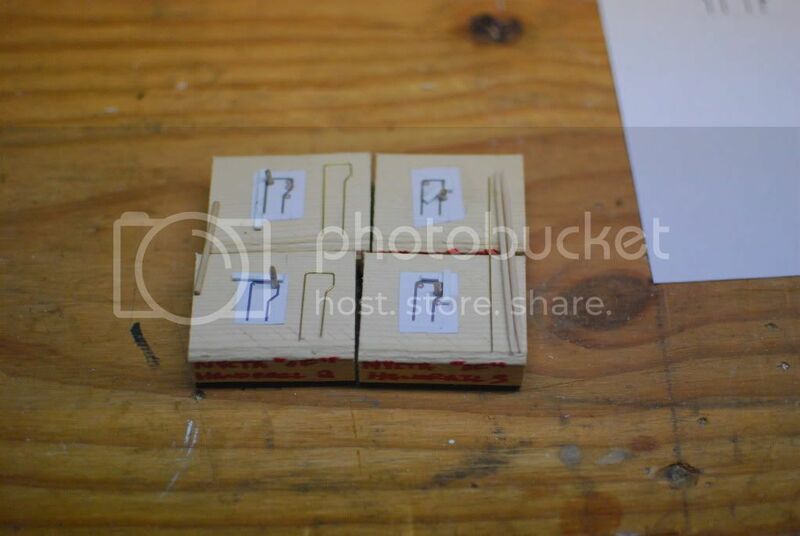 I used the printout as a guide to cut the stock pieces. I also glued part of the template to a piece of cardboard along with some styrene scraps to make a (yet untested) gluing jig. edit: Wow, the "Small" setting in iPhoto is very small. I will post bigger pictures when I have a chance! Progress, as they say! I've built up the pieces into a second "draft" of the flat car. Some additional detailing is necessary to look like the photos, namely the connectors for the side panels and the hand rails inside the car. I've also got to fill in the holes for the coupler box screws from the top with some red auto putty. I've also started design some decals based on a picture I saw on nycsubway.org. I've got working to my advantage that no two of these cars seem to be alike, so any "problems" I have I can pass off as MoE's duct tape. I've got a Badger 350 waiting at the hobby store for me and some paint on order, and I'm going to order some decal paper. I'll post pictures when I've built up some more of the detailing and then again when I get some paint on it. A little more progress on more handrails! This car has a lot of them. Here's a picture of some of the hand rails in progress. There are square, so for the rails on one side, I built them out of .040"x.040" stock; for the next side, I started to make more the same way, but I'm going to try cutting the pattern out of a .040" sheet to see if it's any easier. I used a .005" sheet to cut out the gussets. They are a little sloppy, but I got better at them as I went along. I think I need a magnifying glass bolted to my workbench. I also picked up a Badger 350 and some paint, and I've ordered some waterslide decal paper. As soon as the garage is clean enough to get some painting done, I will post some photos of this thing with some paint on it! Then, I will take what I've learned ... and build four or five more! Don you are doing a great job , keep us posted ! BTW how many of them are you making? Thank you for the kind words! I am making one for now so I can figure out how, then I intend to make four more or so. I am probably doing more work than is necessary given the small number of cars, but I actually enjoy figuring out how to make the jigs and templates and everything. Even if I were only making the one, I would still do that. I also want to make multiples of more complicated cars and locomotives in the future, so it's good practice! So, I've made a small amount of progress. I decided to take the first attempt at this and turn it into a garden-on-flat-car based on Bob's link. I'd hate to waste my original effort, so why not do something fun with this piece, since it's not good enough to be the "real thing". I set up an impromptu spray booth in my garage. I also set up a rotating lazy Susan using a 4" version of this mechanism from the local hardware store. I primed the top of the original flat car, which will be a garden car. I screwed a bit of 1x2 pine onto the top of the mechanism, then screwed the bottom to a bit of ply wood that was sitting around in the basement. When I went to prime the car, the power of the spray kept blowing it off the block, so I taped it down with a rolled-over piece of masking tape. Tomorrow, I'll prime get the bottom. I don't want to peel off the primer with the masking tape, plus the rest of today is off to the in-law's pool! I also picked up some body filler from the auto store, so after I prime the bottom, I'm going to fill in the little holes for the coupler box screws. The stuff I have is a two-part solution, not the one that Steve recommended, so I'll let you know how it goes. The water-slide decal paper I ordered came in, so I have to get some Krylon sealer to seal the ink into the decal paper. I've got some gloss-coat, some yellow and some black paint, some isopropyl alcohol, and some dull-coat. Some time this week, I'll take out the air brush and just spray some alcohol against the fence to get a feel for it. As I'm painting this GOFC, I'll also be putting the finishing details on the proper flat car, which will be pained next. After that, I'll try to "mass produce" four more of them, then on to the next projects! Thanks for reading! I know that the progress is slow, but it's moving! "but I actually enjoy figuring out how to make the jigs and templates and everything. Even if I were only making the one, I would still do that. I also want to make multiples of more complicated cars and locomotives in the future, so it's good practice!" with scratch building you can really pick up a lot of other skills and know how, get to know of lot of new tools, materials and the like! I live in NYC and regularly commute by the subway, many a time i have skipped my train to catch a glimpse of the service diesel loco and the flat cars being towed behind it on an adjacent track. would love to see this one painted and also the whole fleet of 4 on the track. I have built a few locos, so would love to share any know how as and when you get to the Loco build. P.S. what is that last pic in your photo bucket? which looks like a passngr car?